I'm not the newest person in RC but I din't really jump in until last year. and I foresee a lot of money diapering into it. Little Red "so many parts." 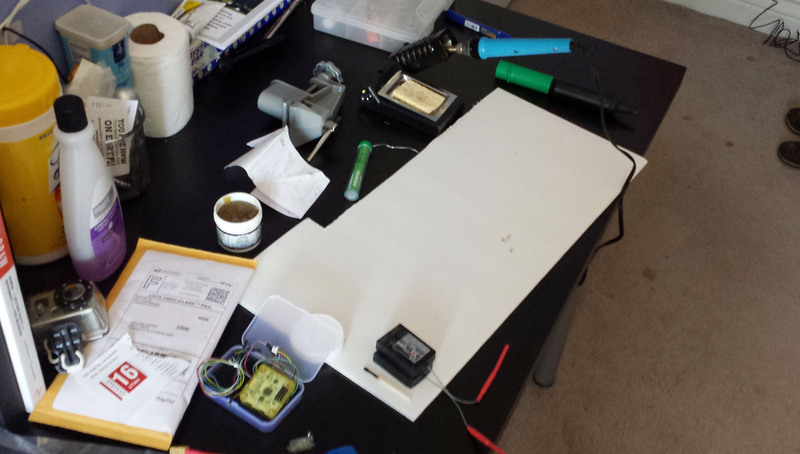 My soldering station is best soldering station! And now for something Completely different! "fpv gear"
This was my first adventure into fpv inolving rc. 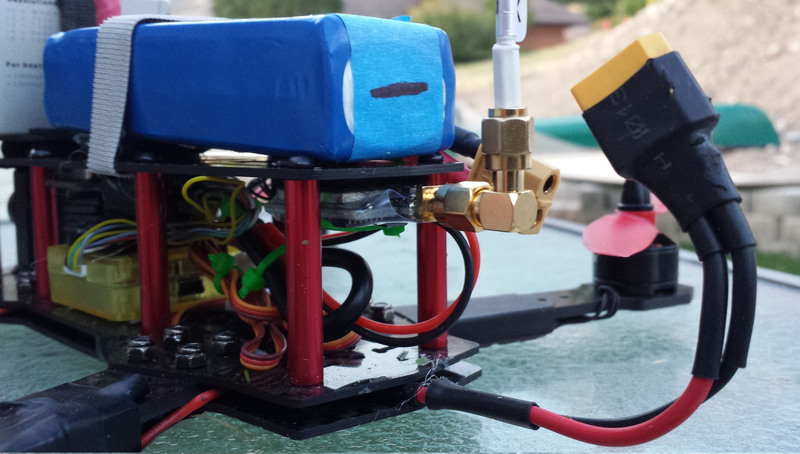 I deced to go with a 5.8ghz plug and play kit with the quontum goggles from Hobbyking. I wanted the goggle experence but I din't want to spend $200.00 on fatsharks entry level ones. Not the best cable management. Well it's done! 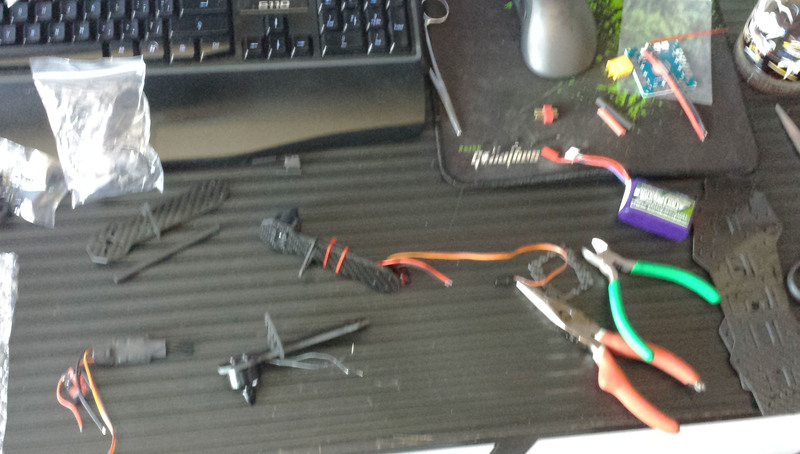 "fpv gear"
I solderer the motors and for some reason I can't figure out now I put them on the bottom of the arms to get chewed up by the ground. 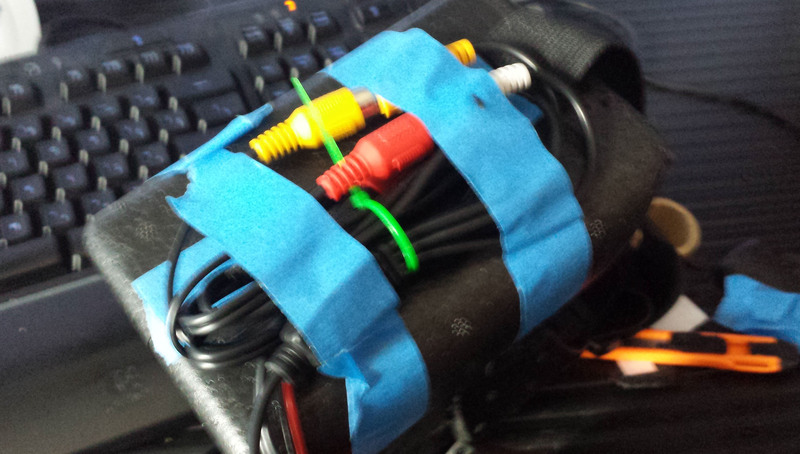 I'll fix it when I upgrade the power or the esc's. Let me know what you think of the build or what I should change or part to change to while I upgrade it. Have a great time flying. 6 inch may be to much for the 1806. 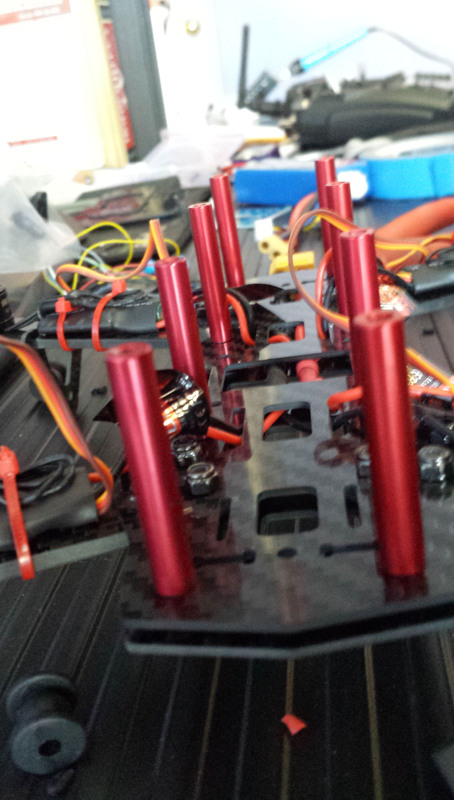 But there the fastest if your motor can spin them, and if your wiring is clean the zmr can fit them. Gem fan is nice and cheap but HQ are better and you will see longer flight times. And DAL unbreakable 5 inches are the cheapest and longest lasting. 3 weeks of service so far. But there really weak on thrust. But in fpv, you really dont notice. But you will notice if you fly hard line of sight. And your antenna choice really matters. My walkera mushrooms fuzz to the slitest vibration, but my fatshark antennas are unbelievable. However many people have great success with some good cheaper brands. As for a camera. Most people use a sony 700tvl. And thats because its afordable and has a good sensor. My 600tvl nock off looks great. But a shadey area or a late afternoon flight will darken my image to unveiwable. Theres a ton of things to do. Just pick and choose based on price. But i would recommend naze32, DAL props, and fatshark antennas the most for bang for buck. But bigger motors and stronger props can be nice to. -there is a hole at the very end of the ZMR top plate that you can carefully drill out using progressively larger bits. You can drill it large enough to fit a jack for your vTX antenna. This will really secure your antenna and vTX in a crash as opposed to risking it being ripped out. -If you are new to FPV DAL props will really work great and save you quite a sum of money when learning. ReadyMadeRC has them for cheap and they ship faster than Surveillzone. -I have those same goggles and really like them. Resolution isn't the greatest and I have trouble seeing small branches, but for now they get the job done. If you find the frame that holds the Fresnel lens gets in your way check out my ZMR build to see a cheap mod I did to remove the frame. -If you find OpenPilot unsatisfactory you can try flashing Tau Labs to the CC3D. A lot of people praise Tau Labs on this forum. Drilling that whole is something I've planed on doing I just haven't got around to doing it. I'm currently ordering 2 to 3 different propeller to play with because I'm going though all my gem fans, and a good rate. 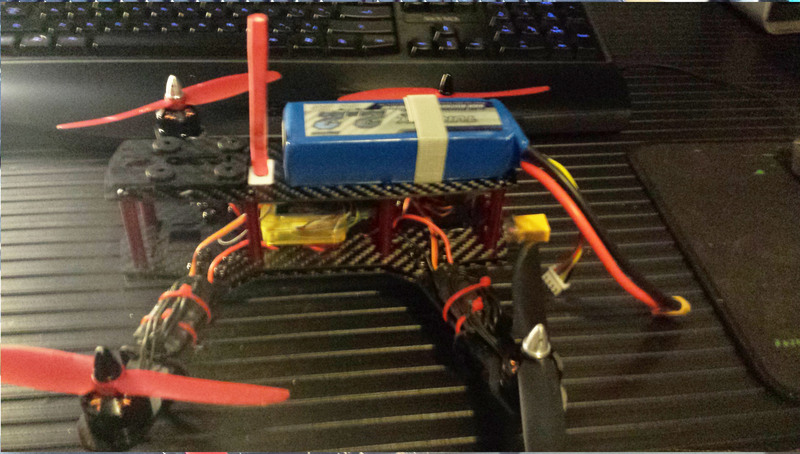 Update: I just ordered some of the DAL props for my quad and a nicer battery strap. 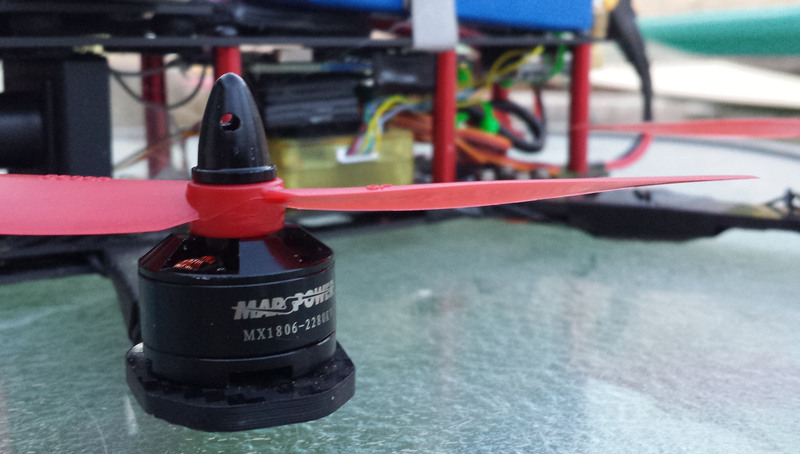 I've been flying with the DAL 5x4.5 props and the power, and durability is amazing I love these things. They also were all for the most part balanced 7 out of 8 were balenced. Great to hear that you've been doing some successful flying! I too love DAL props. 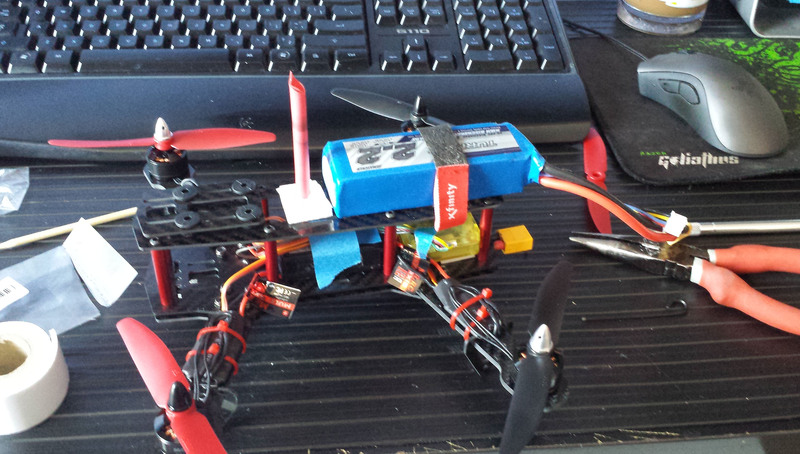 I use 6045 DALs and they really take out the frustration of having to put on new props every time you crash. They are pretty well balanced like you said. Another thing I really like is that there are no shaft size adapters, they just have a 3mm hole, so there is no worry about the adapters when you switch props. Good for people like me with Cobras with 3mm motor shafts, but I guess bad for others with larger or smaller motor shafts. Two upgrades I'd STRONGLY suggest before any others. 1) Make sure you have your contact info on it in a way that won't rub off/wear off so if you have a flyaway you have a chance of getting it back. I use a Dremel engraving tool to etch my info into my frames. 2) Switch to a better RF system or make your own RX's. The RX you're using has no failsafe - if it looses signal it will just keep outputting whatever signal it had last. And FlySky's RF system isn't well known for it's link reliability. You can make your own RX that will work with the FlySky TX from an A7105 module and an arduino Pro Mini for <$10 which will give you PPM output for cleaner wiring and a proper failsafe. Check out this thread on RCGroups for more details: http://www.rcgroups.com/forums/showthread.php?t=1921870 Alternatively you can remove the module on your radio and switch to a FrSky or Spektrum module and RX's. Though that will probably require moving the antenna since most 9x's have the antenna mounted on the radio and hardwired to the module. This is fairly easy to do - just open up the module and unsolder the antenna, then remove the antenna, mount it on the module and resolder...but it is some fiddly soldering and if you mess it up the module won't work well. 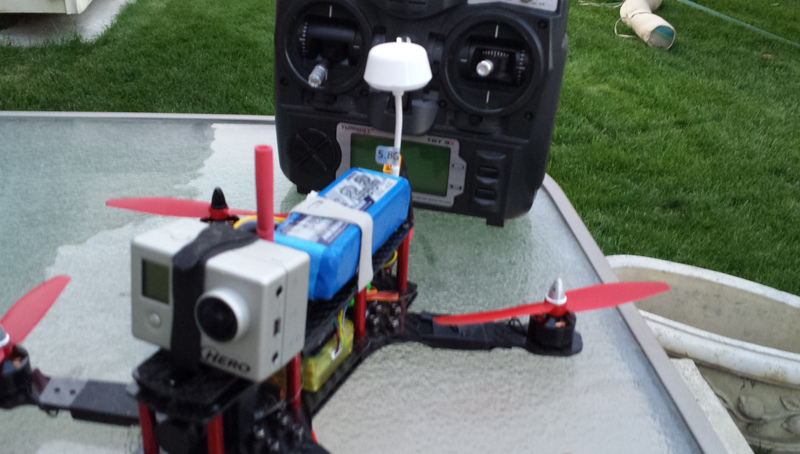 So people just cut the antenna wire and ditch the FlySky module but I wanted to keep mine since I have quite a few FlySky RX's so I relocated the antenna on mine. Just don't want to see you loose your quad to a flyaway - but with the stock 9x RX's you're using it's not a matter of if you'll have a flyaway it's a matter of when! I have planed on upgrading to the frsky module with a satellite receiver for a while. Also I will put my contact information on it thats a great tip. 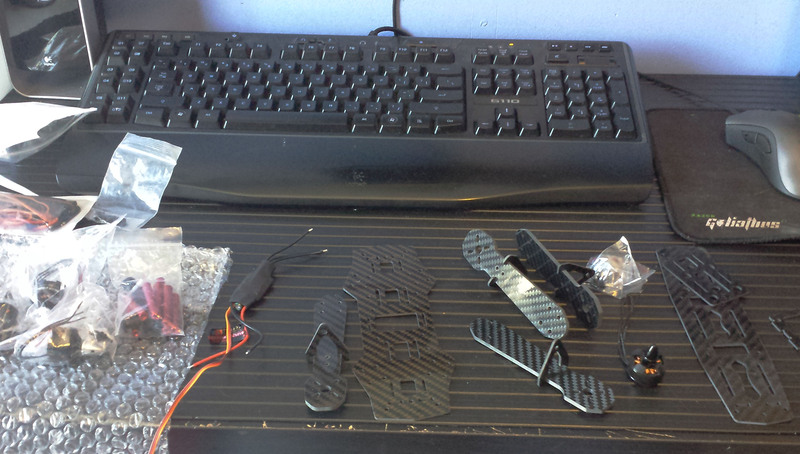 The next upgrades I was looking at after was new ESC + motors. But I'm still trying to pic a motor and esc. So I tried to fly today an discovered that my last crashed fried one of my motors. So it's time to upgrade all of them of course! So I want new motors and esc. I don't want to use kiss esc due to the fire problems + price. But I want something that performs similarly to that's. For the motors I was thinking of cobras but they are hard to fined, so I was thinking of some quantum's instead? So any thoughts or suggestions that I should get? 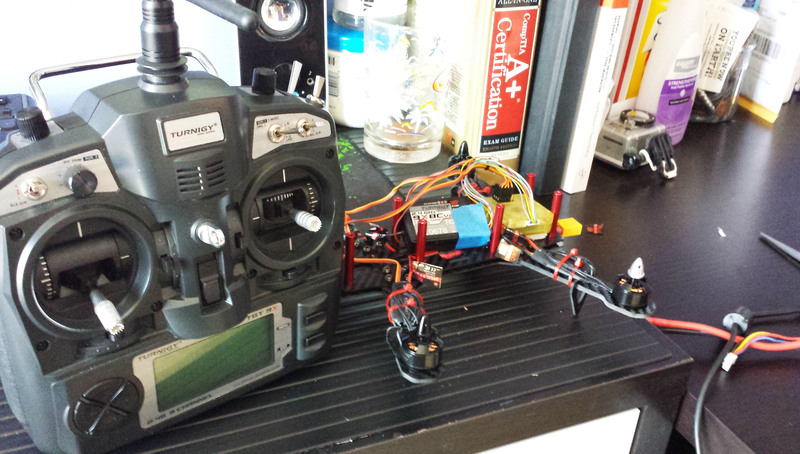 If you can afford them, check out ZTW Spider ESCs in Simon K or BlHeli and Cobra motors. I have good success with these pairings.